Photo in excellent condition. Autograph is authentic and hand signed. You're bidding on a signed baseball of Bernie Sanders. See photos for condition. I have been collecting autographs for over 30 years and have to downsize my collection, so I'm selling some here and there to clear out room. I have a positive ebay rating, bid with confidence. All items obtained directly via signings, rallies, political & sporting events, etc. Bidding starts at $0.99 to encourage more bidders. I offer a 30 day refund policy if you are not happy with your purchase. Please message me with any questions prior to bidding. Shipping costs are for exact shipping based on size and weight. I do not attempt to make money on shipping costs. All photos are shipped in a plastic sleeve inside a stiff cardboard mailer to prevent damage. Best of luck in the auction. On the other hand, the fact that it is a one-page item makes it ideal for framing it. Monrad Wallgren, Washington Governor, Congressman and Senator, printed free frank, dated 1936. Vladimir Putin Autograph Signed Photo COA Certificate Of Authenticity. From Russia Federation. 6x8 Photo signed nicely in pen. You're bidding on a signed baseball of Donald Trump. See photos for condition. I have been collecting autographs for over 30 years and have to downsize my collection, so I'm selling some here and there to clear out room. I have a positive ebay rating, bid with confidence. All items obtained directly via signings, rallies, political & sporting events, etc. Bidding starts at $0.99 to encourage more bidders. I offer a 30 day refund policy if you are not happy with your purchase. Please message me with any questions prior to bidding. Shipping costs are for exact shipping based on size and weight. I do not attempt to make money on shipping costs. All photos are shipped in a plastic sleeve inside a stiff cardboard mailer to prevent damage. Best of luck in the auction. 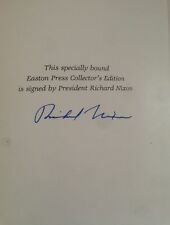 Up for sale is a signed book "Six Crises", boldly autographed Richard Nixon. Mother of Prince Khaled (King Khalid). Country: Saudi Arabia. Year: 1968. You're bidding on a signed baseball of Jimmy Carter. See photos for condition. 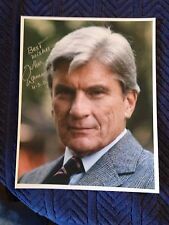 I have been collecting autographs for over 30 years and have to downsize my collection, so I'm selling some here and there to clear out room. I have a positive ebay rating, bid with confidence. All items obtained directly via signings, rallies, political & sporting events, etc. Bidding starts at $0.99 to encourage more bidders. I offer a 30 day refund policy if you are not happy with your purchase. Please message me with any questions prior to bidding. Shipping costs are for exact shipping based on size and weight. I do not attempt to make money on shipping costs. All photos are shipped in a plastic sleeve inside a stiff cardboard mailer to prevent damage. Best of luck in the auction. Houston Benge Tehee was born on October 14, 1874, in Sequoyah District, Cherokee Nation, the son of Stephen and Rhoda Benge Tehee. In 1910, he served as mayor of Tahlequah and was elected to the Oklahoma state legislature in 1910 and 1912. You're bidding on a signed baseball of Joe Biden. See photos for condition. I have been collecting autographs for over 30 years and have to downsize my collection, so I'm selling some here and there to clear out room. I have a positive ebay rating, bid with confidence. All items obtained directly via signings, rallies, political & sporting events, etc. Bidding starts at $0.99 to encourage more bidders. I offer a 30 day refund policy if you are not happy with your purchase. Please message me with any questions prior to bidding. Shipping costs are for exact shipping based on size and weight. I do not attempt to make money on shipping costs. All photos are shipped in a plastic sleeve inside a stiff cardboard mailer to prevent damage. Best of luck in the auction. Earle was born in Philadelphia, Pennsylvania. Mr. Earle married Catharine H. French on 12 December 1881, two years after he graduated from Harvard. Six years after Mr. Earle's death, his oldest son, George H. Earle III, would run for Governor of Pennsylvania on the Democratic ticket. Barack Obama Signed Book. First Printing. Shipped First Class free. 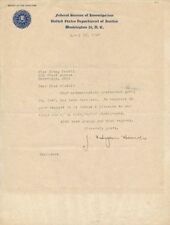 LETTER OF INTRODUCTION TO BARON VON GEROLDT, PRUSSIAN MINISTER TO UNITED STATES ON BEHALF OF D.D. BARNARD, NEWLY APPOINTED US MINISTER TO PRUSSIA, DATED OCT 15, 1850. Item is a full signed magazine, not just the cover. All cards are in MNT-NRMNT condition. All autographs are authentic. ACC Collectiblez LLC is a limited liability corporation incorporated under the state laws of Mississippi, USA. ALL CARDS ARE VERY GOOD - NEAR MINT, UNMARKED WITH SHARP CORNERS. SEE COMPLETE LIST BELOW. City of Toledo. Hand signed by Mayor William J. Ensign. County of Lucas. State of Ohio. Beautiful certificate with attractive vignette. Also hand signed by several other city officials. Usually, yes. 1829 stampless folded letter with red"WASHN. He was removed from office by the newly elected President Andrew Jackson, the year this letter was written. There are 3 duplicates. We need Grant Keys For Congress (with President Kennedy) Campaign. MOST CARDS ARE IN VERY GOOD OR BETTER CONDITION. Bill O'Neill For Governor of Ohio Campaign. In October 1952 at the 19th Party Congress Stalin even attacked Mikoyan viciously. When Stalin died in 1953, Mikoyan again took a leading role in policy-making. In 1964 Khrushchev was forced to step down in a coup that brought Brezhnev to power. Cover signed by 12 UN luminaries, incl. Ralph Bunche. NOTE: You will receive two authentic words from the pen of Lincoln. The perfect gift for the Presidential collector, Lincoln devotee, autograph enthusiast, or History buff. Rare Cut With Middle Initial. 4 Of Only 8. Donald Trump has signed this victory note. Really good looking victory note that would be a the center piece to your collection. Signature:Morena Baccarin. We are passionate about only authentic autographs being sold in the marketplace to avoid fans being sold fake autographs from unscrupulous individuals. You will win the exact item pictured above. CERTIFICATE of AUTHENTICITY (COA) is included. Would make a wonderful addition to your collection. pictures of The ACTUAL Autograph You will Win! Also makes a Great Gift Idea. JACK VALENTI ESTATE Jack Valenti’s working briefcase: Inscribed Leather Briefcase: Jack Valenti. White House LOCKING - NO KEY is in the unlock position. Does have a handle. Inside the briefcase there is a hinge and one pocket. Condition: Pre-owned USED, in good condition for its age, there is some patina and minor wear to the outside of the briefcase including some small scratch and scuff marks! The inside is in very good condition. Selling AS IS Selling a large collection Jack Valenti Estate NOW See our many other Jack Valenti listings! Would make a wonderful addition to your collection. 100% Genuine Autograph, Hand signed by President Donald Trump on May 25th 2016, at the Anaheim Convention Center. You will win the exact item pictured above. The CERTIFICATE of AUTHENTICITY (COA) for each book is included. You will win the exact item pictured above. ACTUAL Autographed Book You will Win! The Axis Powers surrendered to the Allies in the months following FDR’s death, during the Presidency of his successor, Harry S. Truman. with white draw string pouch. Autograph is certified as authentic by Leaf / Panini Trading Cards and includes a Certificate of Authenticity on the back of the card. Signed on a bookplate by George Herbert Walker Bush. Dust jacket is price clipped. Book is in unread condition. Also coauthored and signed by Brent Scowcroft. Would make a wonderful addition to your collection. You will win the exact item pictured above. This is an Original Hand Signed Autograph. The CERTIFICATE of AUTHENTICITY (COA) is included. pictures of The ACTUAL Autograph You will Win! The Original issuers CERTIFICATE of AUTHENTICITY (COA) is included. You will win the exact item pictured above. Would make a wonderful addition to your collection. Also makes a Great Gift Idea. Or you may want to just keep this beautifully hand signed item for yourself, and add it to your personal collection. Donald Trump Sign. This is for 2 Signs & 2 Stakes. 8" x 15" H wire stakes. These Signs were Professionally Produced on a. 12" x 18" 4mm H igh Quality Weather Resistant. Great card for matting. This is not a copy, reproduction, stamp or forgery, but the real deal.